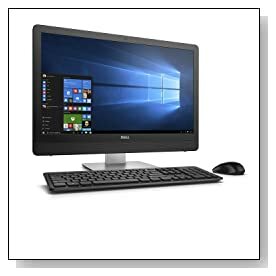 Dell Inspiron 24 i3459-1525BLK is the new All-in-One home entertainment and work desktop as part of the 3000 series, that is suitable for your whole family or office, with a slim and attractive design, a Full HD 24 inch touch display, more advanced 802.11ac wireless, several USB ports, good graphics and visuals and immersive sound. 23.8 inch FHD screen has the 1920 x 1080 pixel resolution with IPS panel with large viewing angles vertically and horizontally. You will experience responsive and reliable performance with the Quarter 4 2015 release ultra low voltage dual core Skylake Intel i3-6100U (3M cache) with a benchmark score of just over 3500 for reliable and powerful performance with no turbo boost but hyper-threading to handle two cores and four threads in parallel, great graphics and multimedia with beautiful visuals. For you to interact with other devices, connectivity options include the DVD-RW Optical DVD Drive that reads and writes to DVDs and CDs, a long range 802.11ac wireless for better internet and Bluetooth 4.0 (dual band 2.4 and 5GHz) tied to wireless card, an HDMI output, a 4-in-1 Multimedia Card Reader, Gigabit Ethernet, USB 2.0 ports and 2 x USB 3.0 ports to interact with other devices smoothly. 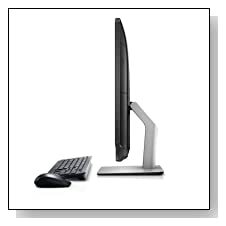 As this is an AlO desktop, you have everything in the screen and a Dell KM632 wireless keyboard and mouse combo, it has a beautiful slim, sleek and modern design and with only a single cord there won't be any clutter on your desk and it is also suitable for being put in the middle of your living room. Waves MaxxAudio and integrated stereo speakers help deliver great quality sound for your movies, songs or games and a decent high definition webcam ensures clear live chats on Skype with friends and family. Storage is the standard size 500GB SATA mechanical hard drive at 5400rpm rotating speed, which may not appear to be a lot but should let you save quite a few movies, songs and other files but we would have liked seeing the more advanced technology SSD. 8GB DDR3L SDRAM (1 x 8GB) at 1600MHz is quite a lot of memory to deal with your heavy multitasking of several apps and browsers so you can run them at once without any delays or freezing, as also the late 2015 release i3-6100U processor can handle quite a bit with a benchmark score of 3513- is suitable for multimedia and office tasks, basic daily or more demanding stuff and good multitasking with the 8GB memory. Black Inspiron AIO with silver pedestal weighs 16.2 pounds and measures 22.7 x 1.5 x 15.17 inches, is very easy to set up straight out of the box (plug in and turn on but will ask you some questions to get things right for you) and will look good in any room of your house. It comes preinstalled with the latest Windows 10 64-bit operating system that also helps run things smoothly, start up and shut down easily and smoothly. Intel HD graphics 520 is similar to the dedicated GeForce 820M GPU and you will play the older games at higher and newer titles of 2015 and 2016 at lower settings and it is perfectly fine for general multimedia tasks. This is a decent All-in-One computer with great looks, functionality and features and seems to deliver good value for money.